Consistent with the core values and mission of the institution, the College Writing Program is committed to providing instruction in the critical assessment and composition of texts of all kinds, including linguistic, oral, visual, and multimodal texts. We recognize that participation in democratic society is reliant upon individual agency, and that such agency is limited without the ability to think critically and communicate effectively. As such we recognize the rights of all individuals to ownership of language and texts. We recognize that each text is both a thought and means of communicating thought, as well as a contribution to the world of ideas and perspectives that constitute our living reality. We fully support higher education as a vehicle for democratic action and a means of allowing individuals greater voice and participation in the construction of culture. 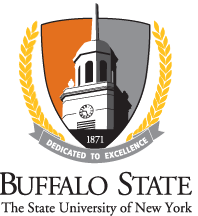 Its commitment to the personal and academic success of each student attending Buffalo State. Its commitment to improving the ability of Buffalo State students to think, read, and compose critically. Its commitment to acting in partnership with the rest of the Buffalo State stakeholders in serving students, their families, and the local and regional communities. We recognize and respect diversity of language. We recognize and respect diversity of perspective. We recognize the right of all institutional members to be treated with respect at all times. We believe in providing rigorous academic experiences supported through best classroom practices grounded in current theory and research. We support underprepared and struggling students by providing access to professional tutoring services. We believe that the ability to construct texts of all kinds is central to the enhanced personal autonomy and professional success of individuals. The College Writing Program espouses a post-process pedagogy. We believe that all textual construction is situated and contextual. This means that all individuals must develop a tool kit of strategies designed to assist them when constructing texts, since all individual texts are designed to reach specific audiences and objectives. In order to construct such individualized texts, students must have a well-developed awareness of their own writing processes, meaning that each individual must recognize the specific tools and processes that they employ in order to meet specific composing objectives. Post-process pedagogy recognizes the multiplicity of composing processes and that these processes are specific to the individual composer, as well as to specific audiences and purposes. As such, a primary objective of both the College Writing Program and SUNY, recognizing that successful texts can only be achieved though the individualized processes of designing, drafting and revision, is to ensure that all students have a tool kit of strategies that they are able to implement in order to meet specific composing goals.